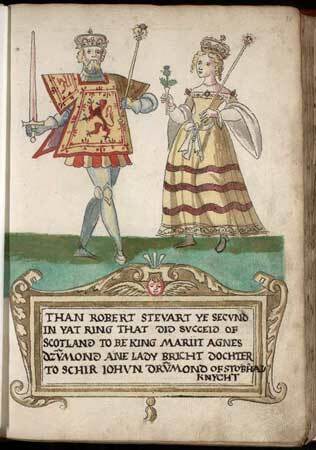 In 1367, Robert III married Anabella Drummond, daughter of Sir John Drummond of Stobhall and Mary Montifex. In 1368 his grand-uncle King David II of Scotland created him Earl of Carrick, and he took some part in the government of the kingdom until about 1387, when a kick from a horse disabled him. Probably in consequence of this accident his brother Robert, Earl of Fife, and not the crown prince himself, became guardian of the kingdom in 1389; but the latter succeeded to the throne on his father's death in May 1390. At this time he changed his baptismal name of John - unpopular owing to its connection with John de Baliol; he also wished to avoid being called John II, as recognition of Balliol's kingship would weaken the Bruce title to the throne - for that of Robert, and became crowned at Scone in August 1390 as King Robert III. Although he probably attended several parliaments, the new king was seen only nominally as the ruler of Scotland, the real power remaining in the hands of his brother, the Earl of Fife. In 1399, however, owing to the king's "sickness of the body," his elder son, David, Duke of Rothesay, gained appointment as lieutenant of the kingdom; but there followed an English invasion of Scotland, serious differences between Rothesay and his uncle, Robert, now Duke of Albany, and finally in March 1402 Rothesay's mysterious death at Falkland Palace. Fearing for the safety of his surviving son, James, the king had the boy hidden at Dirleton Castle, with a view to smuggling him from there to France. However, a month later, in 1406, Englishmen captured the young James en route, whereupon King Robert died, probably at Rothesay Castle. The king allegedly died from grief over the capture of James. Robert even asked to be buried under a dunghill with the epitaph: Here lies the worst of Kings and the most miserable of men. Instead he was interred at Paisley instead of Scone, the traditional burial ground of the Scottish kings, as he did not consider himself worthy of the honour. Robert III married Annabella Drummond (c. 1350 - 1402), daughter of Sir John Drummond of Stobhall, and by her, in addition to the two sons already mentioned, had four daughters (Margaret, Mary, Egidia, and Elizabeth). He also had an illegitimate son, James Stewart of Kilbride.